Case understands what it’s like to be a youth minister. He’s been at it for around 20 years. 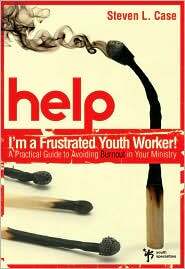 And in this book he brings to the table his experiences with dealing with the pressures of youth ministry. Dealing with direction, conflict and stress are front and centre here. All in the aid of keeping youth ministers in the job longer and stopping them from burning out. If you’re a youth minister and you haven’t thought these issues through (or if you have and you know you need help) then you need to read this book. Help! has one big thing going for it and one (nowhere near as big, but still significant) thing going against it. On the plus side, I can’t think of any other book that deals with these issues for youth ministry. There are some aspects of the youth minister’s job that are unique to youth ministry. Help! will address these issues. On the other hand, I wish this book had gone further. It’s great at introducing the problems and solutions but I walked away wanting more. I would recommend picking up this book along with a book like Peter Brain’s Going The Distance. Read Help! to get you started. Then read Going The Distance to go further. Then go back and read Help! again to filter all that information through a youth ministry lens. If you’re in youth ministry, you need to read this book sooner rather than later. If you think burnout is not something that will impact you, think again. Read this book before you find yourself in too deep and keep yourself strong for the long term. I also found Doug Fields’s ‘Your First Two Years In Youth Ministry’ pretty helpful. Shame I read it in about my 6th year of Youth Ministry. There were a lot of ‘oh, so that’s what I should have done’ moments. Haven’t read that one. Would it be helpful to read at the 10 year mark? yeah, I think so. The way he writes the book is as if you were shouting him a coffee every couple of weeks in your first two years, and he was talking you through all the issues as they come up. There’s good stuff about conflict resolution, finding and training leaders, rest, all that. Actually, another book I read recently and enjoyed was ‘Leadership from the inside out’ … from the Leadership Network series. Can’t remember the name of the author though. Similar to Peter Brain’s book, but lighter and I found it easier to get into.